A warm welcome to Julia Buckley, who brings us the first Christmas recipe of the year. That must mean the holidays can't be too far behind! 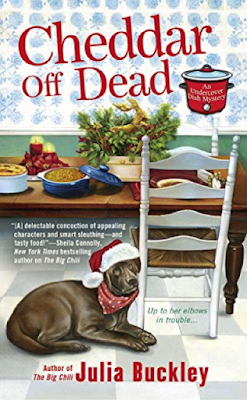 Julia's latest book, CHEDDAR OFF DEAD, the second Lilah Drake Undercover Dish mystery, hits shelves on September 6 and can be pre-ordered on Amazon now. Don't miss her giveaway. Leave a comment with your email address below so she can notify you if you win! 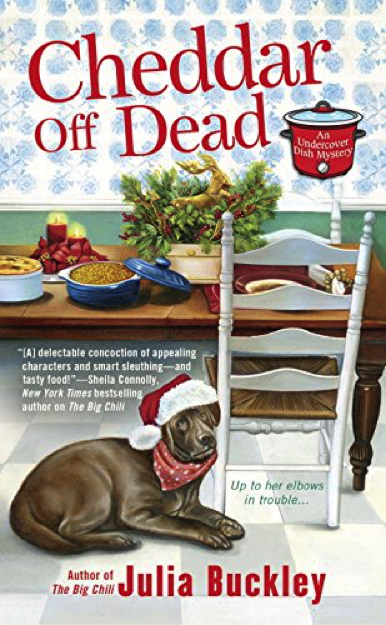 In my latest book, CHEDDAR OFF DEAD (the second in Berkley’s UNDERCOVER DISH mysteries), Lilah Drake continues her career as a secret chef while she also maintains two day jobs that involve cooking and baking. Lilah has a flair for creating food to suit her clientele, and the list of her customers is growing as the series progresses. The book is set at Christmastime, and Lilah is working to make a variety of holiday foods, some of it for her own family. “I focused on my casseroles. The key to a delicious gingerbread is getting the right molasses (I used Angelo’s Gourmet, which had earned a frown from Parker at the convenience store) and the perfect blend of spices. I did some careful measuring of cinnamon, cloves, and ginger, doubling up so that I could make two versions of this particular casserole. I preheated the oven and then dipped my bread into the gingerbread concoction, laying it into glass bake ware, then drizzling it with a sprinkling of nuts and melted butter. Forty minutes later they were all at the table and being regaled with Christmas songs from Serafina’s iPod. I watched as Parker, Cam, and Serafina dug in to the still-warm gingerbread casserole. Cam slathered his with additional syrup and butter, although I had already topped the dish with fresh whipped cream. They started to eat, and I held my breath until I heard the first “Ah,” which came from Parker. He certainly was a loyalist about my food. Despite the dangers Lilah finds herself in over the course of several mysteries, she always feels cheered by the food she makes, and by the appreciative responses from the people who eat it. Food warms the heart and the stomach, and for Lilah, food is a way to show love. With her holiday gingerbread casserole, she does just that. Slice bread into 20 slices (or separate ten rolls) and lay out in buttered baking dish. Blend all of the ingredients and pour them over the slices of bread, making sure that the wet mixture gets under and in between the slices, and that all of the bread is saturated. Cover the mixture with tin foil and refrigerate overnight. In the morning, spread the Streusel mixture on top of the saturated, chilled bread, and bake for 40 minutes at 350 degrees. (Gingerbread tastes delicious topped with whipped cream). Serve with pats of butter and maple syrup. Be ready for a delicious surprise to share with friends or family! Toby’s five children love this recipe, but adults love it, too! Julia Buckley is a Chicago writer. Her recent titles, A DARK AND STORMY MURDER (Berkley, July 6) and CHEDDAR OFF DEAD (Berkley, Sept 6) are available in stores and on Amazon. She lives in a busy house with her husband, two sons, four cats and a big Labrador. Her European mother raised her to believe that Food is Love, and she has followed that philosophy all her life. I hope you enjoy the recipe, or the book, or both—and Merry Christmas in September. J I will choose a winner from among the comments under this post and send them a signed copy of CHEDDAR OFF DEAD, the sequel to THE BIG CHILI. Sounds scrumptious! I will have to make this soon. 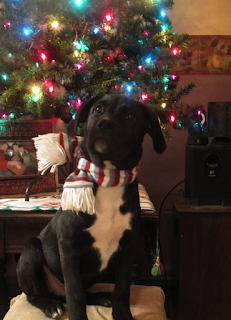 Can't wait for the holidays. Thank you! What size pan do you use? 13X9? Yes! My good glass pan recently exploded--no kidding--when my husband tried to heat its contents over a stove burner. Note to all--don't put a glass pan on top of the stove and heat it with flame. Sure! Thanks for reading the post! Recipe and book both sound delicious! Thanks, Karen. FYI, my favorite teacher in grade school was named Mrs. Barnett. Love Christmas recipes. Cozy Mysteries are one of my favorite. Agree on both counts, Judy! I always like to try a few new recipes during the holiday season---this sounds like a good one. Thanks for the contest---the cover is just darling. Thank you, Sue! I can't take credit for the cover, but I did create the doggy character, whose name is Mick. Sounds like a great Christmas morning dish! Thanks for the contest...can't wait to read the book! 2boys4me (at) gmail (dot) com. Thanks, Amanda! I hope you enjoy the book whenever you may read it. My daughter-in-law is a great cook and I know she would love this recipe. Thanks! Thanks, Donna! I hope she likes it. Food and book both sound great! Thanks, Kim! There are some other fun recipes in the book! Paula, we are the yin and yang of weather. I LOVE the cooler weather and all that comes with it. But of course summer has many pleasures. :) I hope your husband enjoys it! Good luck in the drawing, petite!